Next to the hotel, made up of two luminous rooms with a double bed, a sitting room with a kitchenette and fireplace, two bathrooms with a shower and a wonderful small private garden. The kitchen contains a small oven, a fridge/freezer and crockery. 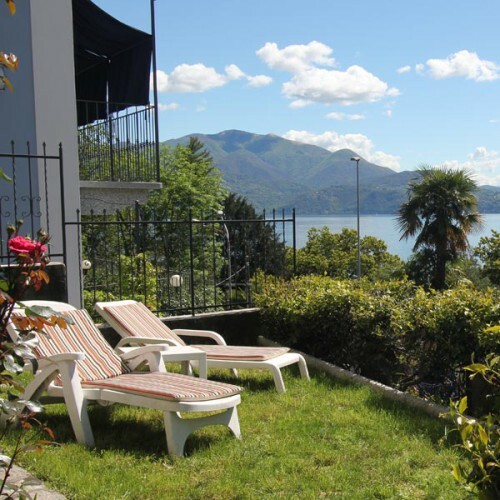 Both the apartment and the gardens have an excellent view over Lake Maggiore and the beautiful Cannero Riviera coastline. Outside there are deckchairs and a table for your comfort and convenience. The hotel is next door to the apartment. Additionally, by choosing this accommodation you can freely use all of our services, including hotel breakfast and the bar service. The apartment has free Wi-Fi, satellite TV with the main Italian and foreign channels. Free car parking. Upon request, storage for bikes and garages for cars. Check-in is available from 8am to 8pm in the main hotel building. If required, check-in can also be arranged at other times. Towels, toiletries and bedding are provided. The apartment (excluding the kitchen) is cleaned everyday by hotel staff.